With mushrooms, the sheer number of possibilities makes them a challenging but fascinating subject. Within the large number of different mushroom species, there is an amazing variety of characteristics. Additionally, some of the features are tactile or even sensory elements, like smell or taste. Identifying mushrooms from a book is a good way to begin learning about them, but when edibility is your goal you must be extremely careful. It is recommended to obtain a first-hand, positive ID from an expert before eating any mushroom, as many of the toxic varieties look similar to the edible ones and could make you very ill, or even kill you! It is tempting to look for a simple rule or test that tells you whether an unknown mushroom is edible; unfortunately, no such rule exists. Taking the time to learn how to identify each species by its unique characteristics (even though some may be hard to see) is the only appropriate method. Teresa Marronne and Walt Sturgeon, in their book Mushrooms of the Northeast, feature hundreds of the most common species found in the Northeast. Using their field guide, we want to introduce our readers to the wonderful world of mushrooms. In today’s post we will talk about morels. Morels are probably the most sought-after wild mushrooms in our area and, perhaps, in the eastern half of the United States. Even novices can easily learn to identify Morels with confidence—once they find some to identify. 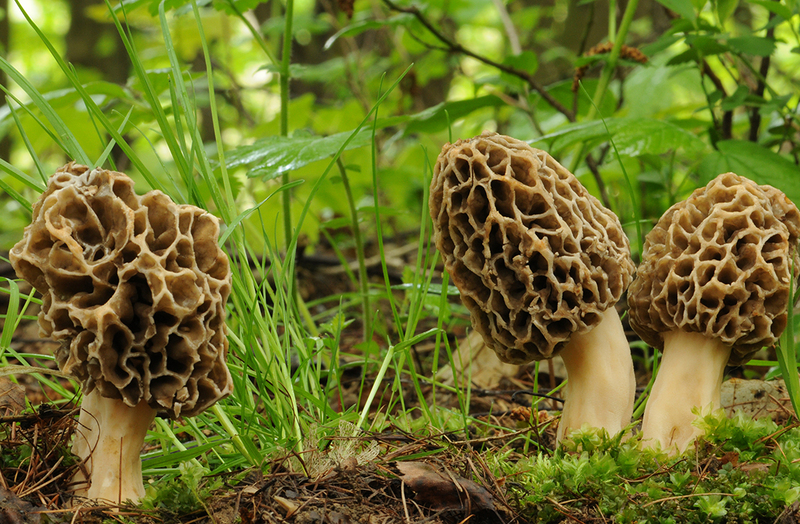 Experienced foragers guard the locations of prized Morel spots like a treasure and have been known to park a mile or more from a favorite spot to throw off anyone who may be following them. The Morel season is very short—typically a few weeks—which adds to their mystique. Like many other mushrooms, Morels are subject to debate about how many species there are and what they should be called; ongoing DNA studies are redefining traditional concepts and discarding long-standing species names. At the simplest, “classic” Morels can be divided into two categories: Yellow Morels and Black Morels. Half-Free Morels are another “true Morel,” but they have some significant differences in appearance. 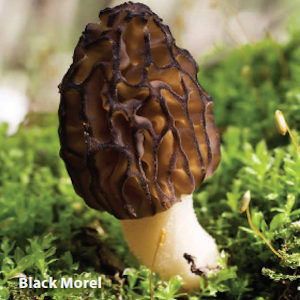 To distinguish between the two classic Morels, compare the colors of the ridges and pits. 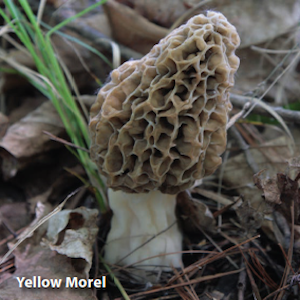 Yellow Morels have pale ridges and darker pits, while Black Morels have dark ridges and paler pits. Morels are typically found around trees that have recently died, especially elm but also cottonwood; they’re sometimes found in old fruit orchards and may also grow under live tulip and ash trees. Although it is rare, they may appear under conifers. They are occasionally found in gardens and shrubbery and sometimes appear on wood chips. Areas disturbed by fire the previous year, or cinder banks along old railroads, can produce Morel fruitings. Morels typically grow singly or scattered but may also grow gregariously or in small clusters. Morels have pitted caps that appear irregularly honeycombed or spongelike. Caps may be conical, egg-shaped, elongated with a rounded top, or nearly spherical. Stems are unpitted, with a smooth or granular texture; they are often crumbly or brittle, and there is no ring. Stems are whitish, cream-colored, or yellowish. They may have a round profile in cross section or may be slightly flattened or irregular; they often appear creased or folded, particularly at the base, which may be slightly wider than the rest of the stem. When sliced lengthwise, both cap and stem are completely hollow (photo above), with no trace of cottony material inside. The cap and stem are seamlessly connected so that the hollow space inside is a single, continuous cavity. There may be a slight jog where the cap texture stops and the skirt starts, and Half-Free Morels have a short skirt around the lower half of the cap, but there should not be a full, loose skirt that hangs from the top of the stem. Interested to learn more about Morels and the many different mushrooms found in the Northeast? Check out Mushrooms of the Northeast: A Simple Guide to Common Mushrooms by Teresa Marrone and Walt Sturgeon.